The myeloid-biased differentiation of splenic early HSPCs from Hepa mice. (A) Analysis of peripheral blood myeloid cell (CD11b+Gr-1+) and lymphocyte (CD3+ T and B220+ B cells) reconstitution chimerisms in recipient mice (BM, n = 7 mice per group; spleen, n = 9 mice per group). *P < 0.05, **P < 0.01, and ***P < 0.001, by 2-way ANOVA with Bonferroni’s correction. (B) Quantification of CFU-C activity in BM and spleens from control (n = 7) and Hepa (n = 8) mice. ***P < 0.001, by Student’s t test. BFU-E, burst-forming unit–erythroid. 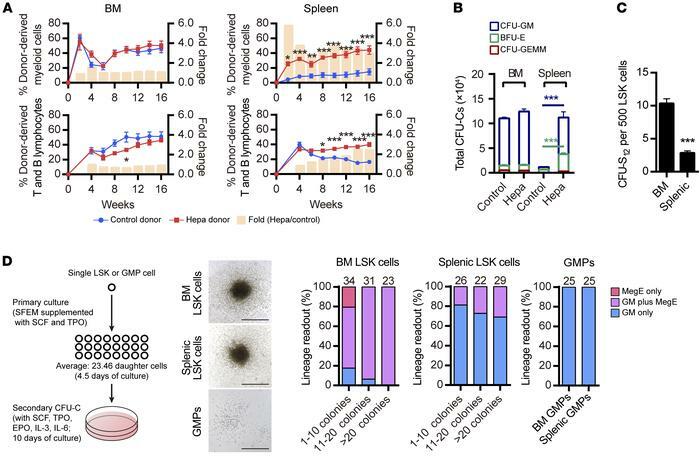 (C) CFU-S12 activity of 500 BM-derived (n = 15 recipients) or splenic (n = 21 recipients) LSK cells from Hepa mice. ***P < 0.001, by Student’s t test. (D) Scheme of the 2-step single-cell colony-forming assay, representative colonies, and the percentage of different types of lineage readouts of the secondary CFU-C. Scale bars: 500 μm. Numbers above the columns represent the sample size of the initiating single cells in each group. Results are shown as the mean ± SEM of mice in each group (A–C). Data are from 2 experiments (A and B) or 3 experiments, with cells pooled from 6 to 10 mice (C and D).